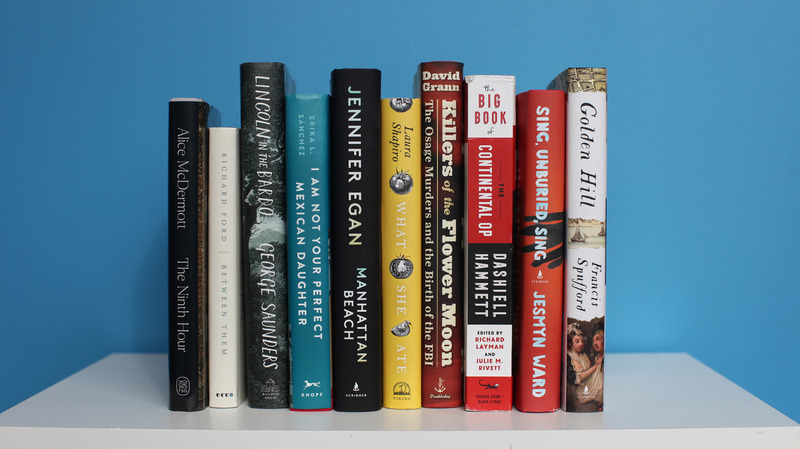 Maureen Corrigan Picks Books To Close Out A Chaotic 2017 Fresh Air's book critic says her 2017 list is chaotic in a good way. "These books zing off in all directions: They're fresh, unruly and dismissive of the canned and contrived." Jesmyn Ward's gorgeous and bleak novel, Sing, Unburied, Sing, takes readers on the great American road trip. But unlike Jack Kerouac's carefree roadster, Ward's junker is loaded down with a baby in a car seat, a couple of ghosts, a package of crystal meth and the oppressive weight of racism — past and present. A host of narrators take turns telling this tale, but the most compelling voice belongs to Jojo, a 13-year-old biracial boy who's forced to grow up too fast; in the process, he comes to a deeper understanding of how he's valued — or used — by members of his family. George Saunders' ingenious novel, Lincoln in the Bardo, is a ghost story with origins in fact. When 11-year-old Willie Lincoln died of typhoid fever in 1862, his body was interred in a borrowed mausoleum in Washington, D.C. Newspapers reported that President Lincoln visited the crypt to open his son's coffin and hold his body. Saunders makes charged connections here between a president stranded in grief and a nation mired in the blood and gore of the Civil War. Alice McDermott's stunner takes place in early 20th century Brooklyn, N.Y., mostly in the basement laundry room of a Catholic convent. Out of this confined situation emerges a sweeping cautionary tale about the pitfalls of female self-sacrifice. McDermott's language is, as always, precise and lyrical. She can make music even out of a catalog of laundry supplies: "Borax and Ivory and bluing agents ... bran water to stiffen curtains and wimples, alum water to make muslin curtains and nightwear resist fire." A tribute to New York City and its seaport, Jennifer Egan's Manhattan Beach is an atmospheric and adventurous historical novel about women working at the Brooklyn Navy Yard during World War II. In drawing from the classic catalog of New York stories — everything from Betty Smith's A Tree Grows in Brooklyn to Joseph Mitchell's briny essays in The Bottom of the Harbor — Manhattan Beach also takes its place among them. Francis Spufford's ingenious historical novel, Golden Hill, is set in 1746, in the teeming streets of what is now Lower Manhattan — a place of dark alleys and twisted virtue. On a gloomy November evening, a ship sails into the harbor and a stranger disembarks. Rumors swirl that "Mr. Smith" is in town to stir up pre-Revolutionary trouble against the crown. Before his adventures end, Smith will get a tour of the city's taverns, theaters, debtor's prison and dueling grounds. Ultimately, the mystery of Smith's identity will turn out to be as intricate as that of old New York itself. Nobody gives "ordinary" human beings their due with the grace and precision that Richard Ford does. His slim new memoir about his parents is so gently spellbinding that I've already read it twice. Ford's father, Parker, was a traveling bleach salesman in places like Mobile, Ala., and Little Rock, Ark., during the 1930s and early '40s. Ford's mother, Edna, (and later young Richard) would often go along for the ride, stopping at the grocery stores that dotted his father's route and staying at the small hotels and rooming houses that were the homes-away-from-home to traveling salesmen. Part of the bonus of this little book is that it sits readers down in the company car and takes us on an unsentimental but enchanted journey through the long-ago landscape of the American South. David Grann's fascinating book, Killers of the Flower Moon, transports us to 1920s Oklahoma. Members of the Osage Indian nation struck it rich when oil was discovered beneath the land they'd been exiled to by the U.S. government. But the wealthy Osage, whom the newspapers playfully dubbed "red millionaires," were plagued by a rash of murders — via poison, arson and bullets — which brought the newly formed FBI to the area. In What She Ate, Laura Shapiro follows the "food trails" of six prominent women — including Dorothy Wordsworth (the poet's shy, worshipful sister), Eleanor Roosevelt and Eva Braun — and discovers fresher narratives lurking beneath their familiar life stories. All six women have been the subjects of earlier biographies, but as Shapiro points out, "Biography as it's traditionally practiced still tends to honor the old-fashioned custom of keeping a polite distance from food." In contrast, Shapiro slyly likens her method of biographical research to "standing in line at the supermarket and peering into the other carts." In the sizzling category of young adult fiction, Erika L. Sánchez's novel, I Am Not Your Perfect Mexican Daughter, is a standout. Julia is a 15-year-old Mexican-American girl living on the South Side of Chicago. She's restless, angry and uncomfortable in her own skin, always feeling secondary to her "perfect" older sister, Olga. But when Olga dies in an accident, Julia becomes weighed down by obligation to her grieving parents. Smart and unpredictable, Sanchez's story delves into the vexed subject of female ambition. I could rattle off 10 recommendations for best books in the mystery category alone, but I'll end this list by bowing to a heavyweight of a hard-boiled collection that's just been published. It's called The Big Book of The Continental Op and it gathers — for the first time, ever — the 28 short stories, two novels and one unfinished tale starring Dashiell Hammett's first series detective, known only as "The Continental Op." The name "Op" derives from slang for a detective. Hammett's hero is an "operative" working for the Continental Detective Agency. In the early 1920s, Hammett revolutionized the figure of the detective and the language of detective fiction through the Op, whom he referred to as "a little man going forward day after day through mud and blood and death and deceit." I can't imagine a more pleasurable way to close out this chaotic year than by following the Op through the fogs of a bygone San Francisco.